Supercalifragilistic . . . Um . . . Oh, To Heck With It! I remember the day I went from being a book lover to an actual reader. No, I don’t remember the exact day or date, just the experience. It was on a weekend and I was at my grandparents’ house in Santa Ana, California. I was sitting in my grandfather’s big, comfy chair totally absorbed in a beautiful, hard bound edition of the complete Mary Poppins stories by P.L. Travers. I sat in that chair for hours and devoured page after page about that magical nanny. It was the first large hardback book I ever read all the way through and, being only 9 or 10 years old at the time, I was quite proud of myself. 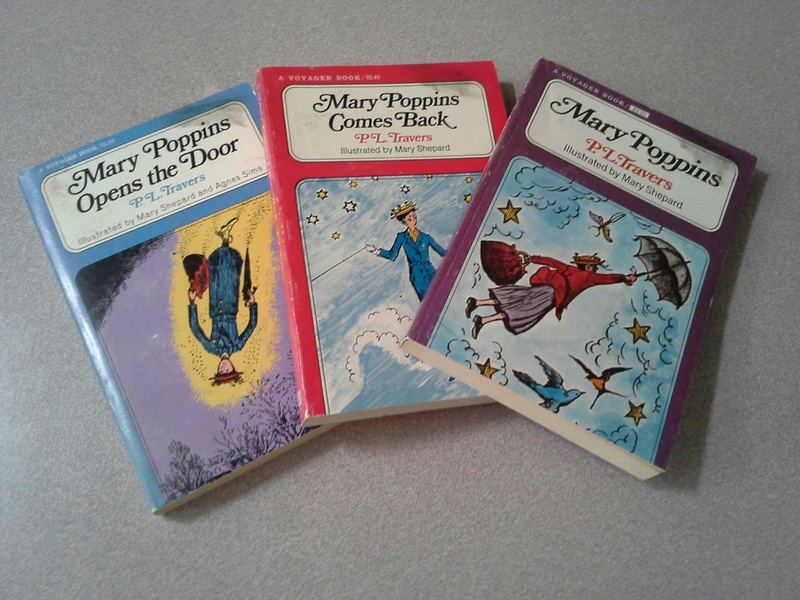 I bring this up because the other day at my favorite thrift store I came across three Mary Poppins books, in paperback, conveniently banded together. I think I paid fifty cents for all three. It’s been over 40 years since I read Mary Poppins, and with the movie “Saving Mr. Banks” (you DO know who Mr. Banks is, don’t you?) out on DVD now, I’m really looking forward to revisiting these stories. By the way, P.L. Travers wasn’t your run of the mill children’s writer. She was what you might call an intellectual adventuress (among other things). She had a fascination with the world’s mythologies and traveled extensively. Back in the 80’s she was a regular contributor to the quarterly publication Parabola, which explored various myths and legends and their effects on culture and religion. Though she is no longer with us, she definitely left her own mark on our culture. Keep your eyes on the East Wind! My last post was on the theological virtues as expounded in Louis Markos’ book, “On the Shoulders of Hobbits.” Of course he covered the familiar trio of faith, hope and love, but then he threw in a fourth one: friendship. That one had me scratching my head a bit. I can agree that friendship is a virtue, but a theological virtue? Then I started thinking about it. Darn, I hate when that happens! A little research, a little scripture reading and it started to make sense. In fact, friendship fits in perfectly with faith, hope and love. Before I go into how this all works together, let’s take a look at friendship in general, and in the eyes of C.S. Lewis and J.R.R. Tolkien in particular. As for Tolkien, I don’t know if he ever wrote directly about friendship but its place in his heart is obvious by its place in his masterpiece, The Lord of the Rings. Truly the central, driving force of this epic is a series of friendships, anchored by Frodo and Sam. Of course Merry and Pippin’s bond is practically as strong and their adventures when separated from the Fellowship provide wonderful examples of why friendship can rightly be called a virtue. Then there’s the relationship between Gimli and Legolas, proving that even seeming enemies can develop strong friendships. So what is this thing called friendship? Markos quotes Lewis describing it as “that luminous, tranquil, rational world of relationships freely chosen.” Further, many ancient people looked upon friendship as the most human of all relationships, in some cases more important than family. I’ve heard it said that friends are the family you choose. A friend is not just someone you hang out with at the mall or go to the movies with. A friend is a person you willingly cast your lot with, extend loyalty to, and stand behind with a steadfast spirit. There is a type of affection that goes with it, but it isn’t of the overtly emotional variety. Friendship is as common as an ordinary day, and as wondrous as the night sky. Friendship is also a key theme in the Bible, though often overlooked. Many times God related to His chosen ones as friends. God refers to Abraham as “my friend” (Isaiah 41: 8). Exodus 33:11 tells us that ” the LORD used to speak to Moses face to face, as a man speaks to his friend.” And Psalm 25:14 states that “The friendship of the LORD is for those who fear him, and he makes known to them his covenant.” When you stop to think about it, it’s rather amazing that God, the creator of heaven and earth, would willingly relate to humans as friends. But how can this work? First off, we have to define what friendship means, especially in relation to God and Jesus. I hear a lot about having a “personal relationship” with Jesus these days, but exactly what do people mean by this? I have a hunch that it means different things to different people since “personal relationship” is such a vague expression. People these days like “vague” because it gives them the wiggle room to define things any way they want at their convenience. But I think Jesus had something a bit more specific in mind. 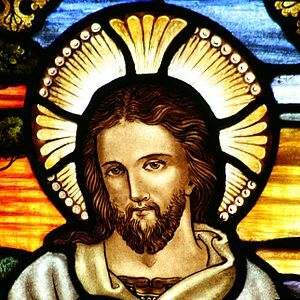 As a matter of fact, he tells us exactly what kind of relationship he expects in John’s gospel: “You are my friends if you do what I command you. No longer do I call you servants, for the servant does not know what his master is doing; but I have called you friends, for all that I have heard from my Father I have made known to you.” (John 15: 14,15, ESV). Friendship is the model Jesus would have us follow. This makes perfect sense since friendship is an excellent channel for the practice of the agape type of love that is referenced so often in the New Testament. This is the love of willing sacrifice and self-giving. It involves steadfast loyalty and support even during the hard times. Especially during the hard times. And while there may be an emotional component that goes along with it, it isn’t of the butterflies-in-the-stomach variety that can vanish so quickly. Together friendship and agape love form bonds that are meant to last a long time. Maybe into eternity. Put all this together and it seems almost obvious that friendship is truly a theological virtue. Further, it is one that is familiar to all of us. Can we use our existing friendships as models of relating to God? In many cases, yes. We can also learn by reading about great friendships, like the ones in The Lord of the Rings and other great works of literature. Examples abound all around us. We just need to look, pay attention, and practice being God’s friends. particular, but also the everyday wisdom of ordinary life. Some might call that “common sense.” Whatever you choose to call it, I think we can agree it’s in short supply these days. I’ve been thumbing through some of my Bible commentaries and reading about the sources and types of wisdom literature. I’ve also been keeping my eyes open when I go book hunting for works dealing with virtues, values, morals and wisdom. But not ethics. I’ve tried reading books on Christian ethics and they work better than Melatonin on me. Then just after Christmas I stumbled across a website and an author who had a new book coming out in February 2013. The author is Louis Markos and the book is “On the Shoulders of Hobbits: the Road to Virtue with Tolkien and Lewis,” (Moody Publishers.) Needless to say, I ordered it. I’m glad I did. This is one of the most enlightening books I’ve had the pleasure of reading. There was so much to learn in it and I enjoyed every bit. It was obviously written by a natural teacher, someone who knows his material and knows how to share it. Plus, Markos uses the works of J.R.R. Tolkien and C.S. 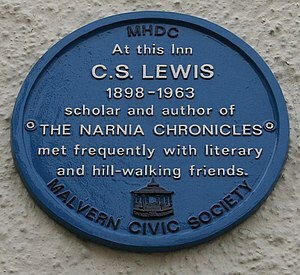 Lewis to illustrate his points; indeed, he immerses us in Middle Earth and Narnia, granting insights into the moral thinking of these two great authors. My copy is proudly dog-eared and underlined. Yours will be too if you follow my advice and purchase this book. As I wrote in my previous post, this book deserves more than a one-shot review. I believe I used the word “delve” to describe how I’d like to approach this. So let’s get started. The obvious place to start is with the author, Louis Markos, PhD. I guess it shouldn’t surprise me that there are so many brilliant people out there that I’ve never heard of. I mean, who has time to keep up on everything being written today? But once in a while, I come across a writer that just floors me and I wonder, “Why haven’t I heard of this person sooner?” Dr. Markos is one of those. He’s an English professor and Scholar in Residence at Houston Baptist University, as well as an expert on C.S. Lewis (one of his heroes), and J.R.R. Tolkien. He’s also well versed in film criticism, which I found out by reading the bibliographical essays at the end of the book. The back cover says he’s also a highly requested speaker. How he found time to write this book, I can’t guess. I encourage you to go to his webpage and read some of his essays and biographical information. But the main thing that hooked me right from the start is that this man “gets” the importance of Story, as evidenced by the title of the book’s introduction, “Stories to Steer By.” To Markos, “stories provide not only models of virtuous and vicious behavior but a sense of purpose – a sense that our lives and our choices are not arbitrary but that they are ‘going somewhere. '” As a theologian once put it, we humans live our lives swimming in a sea of story. That’s all for now. Next time I’ll begin to explore the actual subject matter of On the Shoulders of Hobbits. I hope you’ll join me for the trip.